Event Horizon Telescope: Goethe University is participating via the ERC-project Black Hole Cam. 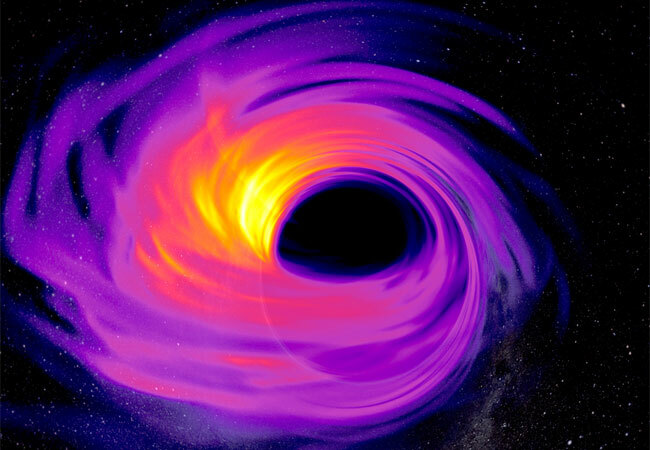 As part of the collaboration „BlackHoleCam“ the research group of Prof. Luciano Rezzolla of Goethe University Frankfurt contributes to the international Event Horizon Telescope (EHT) Collaboration, which is imagining for the first time the black-hole candidate at the Center of our Milky Way. Frankfurt. The international Event Horizon Telescope (EHT) Collaboration, which is imaging for the first time the black-hole candidate at the center of our Milky Way, has a major research focus in Germany. A significant contribution to this experiment is part of “BlackHoleCam”, a German-Dutch experiment founded in 2014. The research group of Prof. Rezzolla at the Institute for Theoretical Physics at the Goethe University Frankfurt is part of the collaboration. BlackHoleCam is supported by the European Research Council via an ERC Synergy Grant of 14 Million Euros. Due to the strong pull of gravity, not even light can escape from black holes, whose surface, i.e., the event horizon, cannot be observed directly. However, the boundary which separates photons that are trapped from those that can escape from the incredible gravitational pull is called the black-hole “shadow”, because it would appear as a shadow against a bright lit background. It is such a shadow that is the target of series of observations presently ongoing of Sgr A*, the name of the black-hole candidate in our Milky Way. During the observations, the researchers will analyze the radio emission emitted by Sgr A*, whose mass is 4.5 million times that of our Sun and whose shadow is about half of the size of the distance between the Sun and the Earth. This shadow image can be regarded as the starting point for the theoretical research of Prof. Rezzolla’s group. Besides predicting theoretically what type of image scientists is expected to observe, the group in Frankfurt is also working on determining whether it will be possible to establish if Einstein’s theory of general relativity is the correct theory of gravity. There are several other theories of gravity besides the well-known one by Einstein and the observations of the black-hole shadow may help to identify the true one. Because of this, scientists in Frankfurt analyze the size and the geometry of the shadow and compare them to synthetic images generated on supercomputers which model accretion flows onto black holes.. These images are computed by solving the equations of relativistic magneto-hydrodynamics and tracing the orbit of photons around black holes in different theories of gravity using state-of-the art numerical tools developed in the group of Prof. Rezzolla. Comparing the synthetic shadow to the observed one may shed light on the existence of one of the most extreme predictions of Einstein’s theory of gravity: the existence of black holes. However, as Prof. Rezzolla remarks, “These observations represent a major step forward in the international attempt of understanding the nature of the dark and compact object at the centre of our Galaxy. However, they are just the first step and it is likely that many more observations of increasing precision will be necessary for finally settling this fundamental issue”.